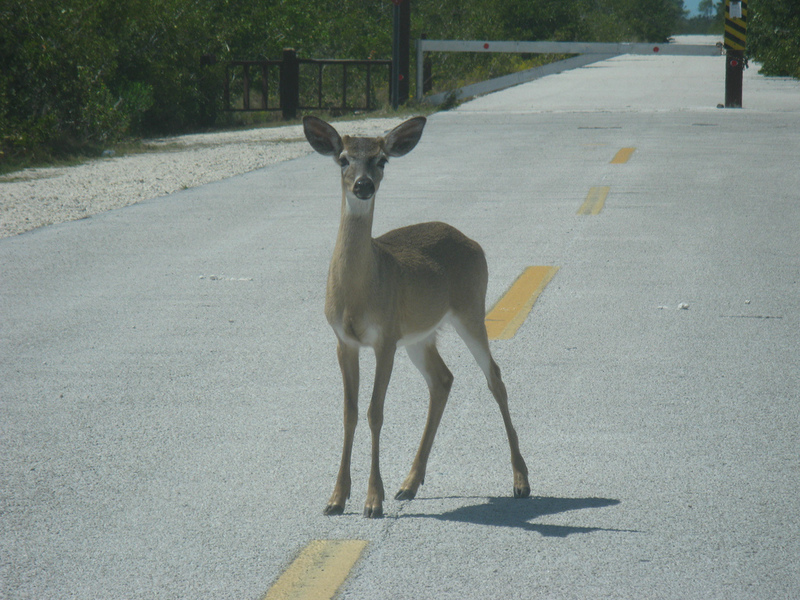 Welcome to the little known and even harder to find National Key Deer Refuge on Sugarloaf Key. When I tell you that this place is desolate, remote, out in the boonies, & in the middle of nowhere I’m not kidding at all. I’m telling you now, this IS NOT a place for a family picnic, there’s no amenities & no attractions at all… AT ALL… there is absolutely nothing here, no restrooms & no tables. It consists of a straight 2-mile long road through scrub brush surroundings with the pavement ending several hundreds of feet before the water (as seen below). 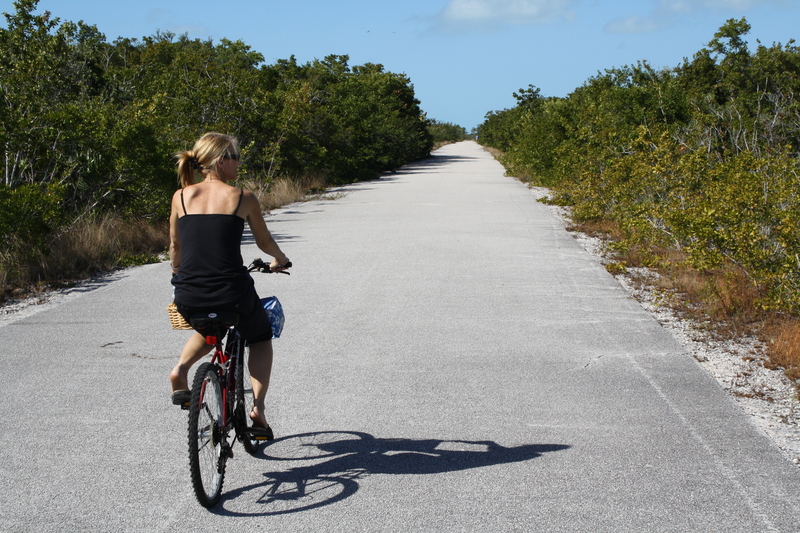 This is a place for two types of people, die-hard nature lovers & bike riders seeking solitude. We are the second type and do what others won’t and don’t (as seen below)… we chose to picnic on the pavement after peddling to its end. Motorized vehicles are prohibited, only by roller blades, hiking, or biking will you be able to enter… remember, this is a refuge NOT a park! To gain access to this remote refuge, you must first avoid Bambi as I did (as seen above) and then park your car outside the main gate (ok, the only gate) 🙂 then either hoof it or cycle the rest on your own… and I do mean on your own since you’ll probably be the ONLY ONES in the entire refuge during your visit which we like at times! I’ve known of this place for years and have made this journey approximately 5 times now and love it. 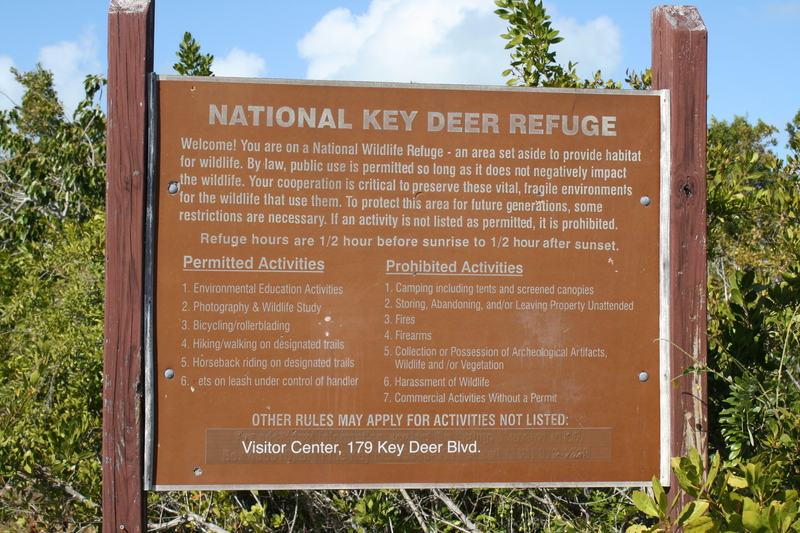 You can find this almost forgotten refuge at Mile Marker 19.4 bayside right at Sugarloaf Elementary School on Sugarloaf Key. Turn onto Crane Boulevard and drive past the infamous trio of road signs; Rocky Road, Bad George Road & Mad Bob Road then keep on the same road even after it curves left and head straight for its end. It’s well worth the time for some serious alone time with nature… that is, if you’re into that!